Meatballs! Love. Love. Love meatballs. Any kind of meatballs! 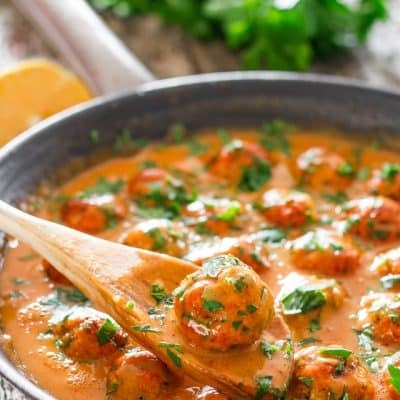 So here’s why I think these meatballs deserve the word skinny in the title. Two things. Lean ground chicken and they are baked. Yum! But you know what I love about these meatballs the most? It’s that sauce, oh my, that sauce has coconut milk, red curry paste, and peanut butter. You know what happens when you put all these together? You get one hell of a delicious sauce. And those meatballs sure do love that sauce and they soak it up nicely. These meatballs are perfect over rice, some mashed potatoes, and of course over some noodles. I enjoyed eating them just like that, just with the sauce, they’re so good smothered in that sauce, sweet with a hint of spicy, love those Thai flavors. 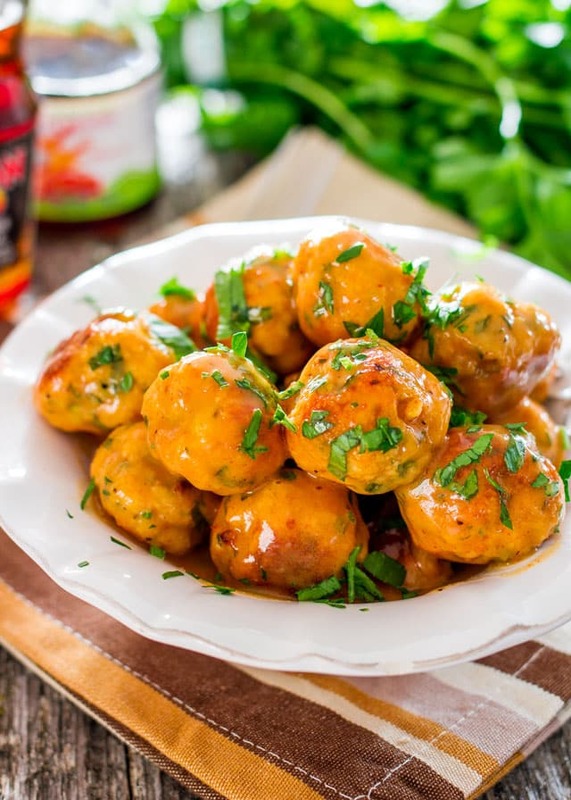 Skinny Thai Chicken Meatballs with Peanut Sauce - healthy baked chicken meatballs with Thai flavors and smothered in a sweet and slightly spicy peanut sauce. In the meantime you can make the sauce. Heat the oil in a medium sauce pan or skillet. Add the red curry paste and cook for a couple minutes. Add the remaining ingredients, stir and cook for about 5 minutes. 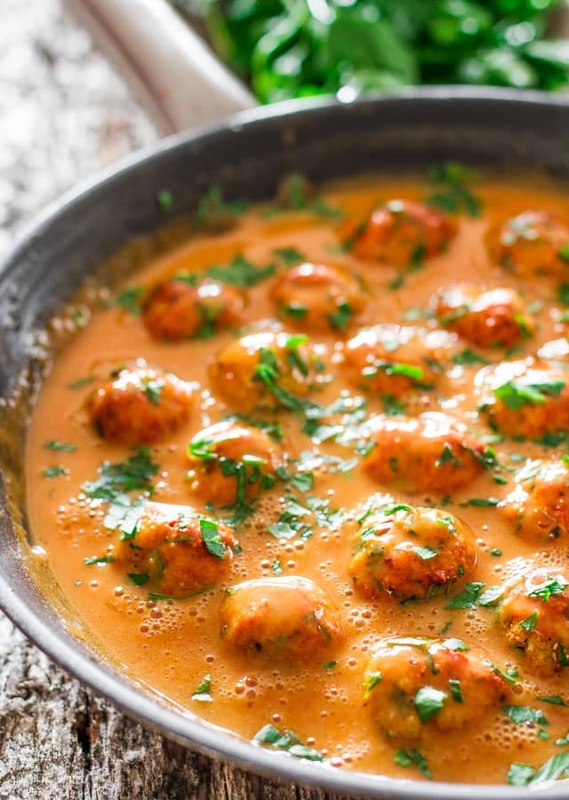 Add meatballs to sauce and toss so that the meatballs are fully coated. Garnish with parsley or cilantro. Serve with a side of mashed potatoes or rice. Can I use any other type of meat: Any ground meat would work, so feel free to switch it up. You can also combine meats like ground pork and ground beef together. Can I fry these: Yes! Heat about a tbsp of oil in a skillet then add the meatballs and fry until golden all around, should take about 7 to 10 minutes. Can I make these ahead: Yes! Meatballs usually reheat really well. If you're making these ahead, store the sauce separately in another container in the fridge. Before ready to serve reheat the sauce either in the microwave or in a small saucepan. To reheat the meatballs just reheat them in the microwave for 2 to 3 minutes. 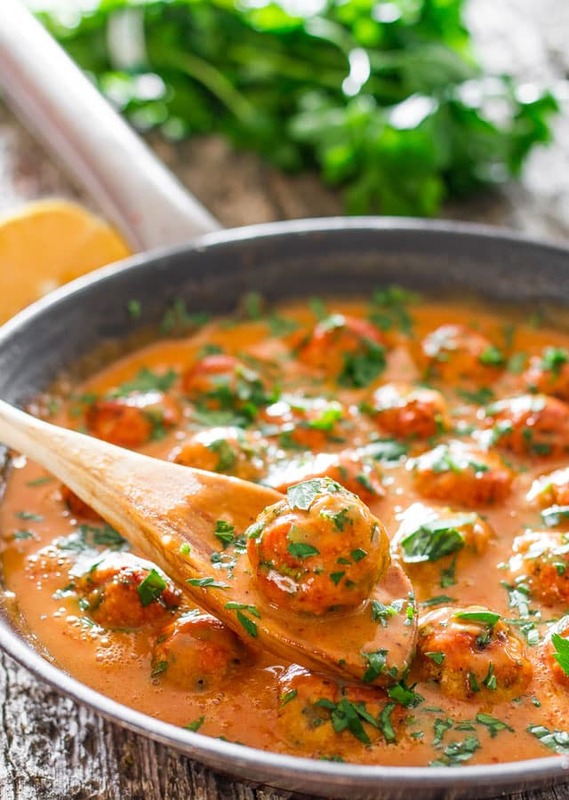 After everything has been reheated, pour the sauce over the meatballs, garnish and serve. 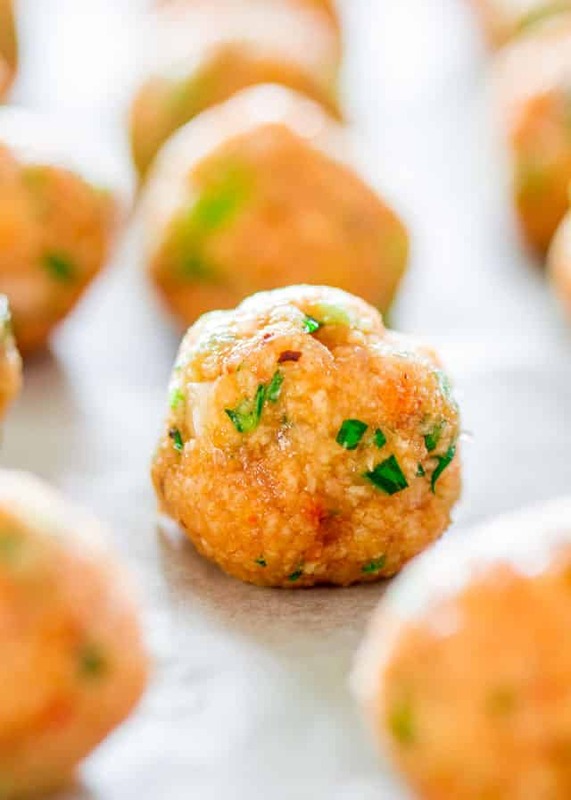 Can I freeze these meatballs: Yes! Follow the instructions for making these ahead, and store them in the freezer separately both in an airtight container. How do I store leftovers: Refrigerate leftovers in an airtight container for up to 3 to 4 days. Recipe yields about 24 meatballs. These were delish! This was the first time I have ever used ground chicken! I was pleasantly surprised at how flavorful this dish turned out! The sauce was a little spicy for my kiddos but they ate the meatball! I’ll make this recipe again! I have made this dinner for my family a few times now. It has turned out great every time. Give it a go tonight. This looks awesome. Quick question, I don’t have red curry paste but I have a ton of the yellow curry powder, how much of that could I use instead (I would really rather use what I have already), I understand it won’t taste quite the same. I would start with a tablespoon and adjust from there to your own preference for how strong you’d like the flavor to be. O.M.G. THIS recipe! It’s so amazing. I left out the chili flakes for my kids, but I could drink the sauce and I had a hard time not just eating all the meatballs in the sauce while standing over the stove. Make this tonight! Was good but I had to up the amount of red curry paste and chili flakes to get it to a desiered taste, we like spicey and we didn’t find it had enough kick. Added 1 extra tbsp of red curry and another 1/4 tsp of red pepper flakes. Those rolls sound fantastic. We’ll have to try those out next time if we have any leftovers!